Bhubaneswar: A special short film ‘Chalo Jeete Hain’ narrating the childhood of Prime Minister Narendra Modi was screened at SoA University at Bhubaneswar on Tuesday. Odisha Governor Professor Ganeshi Lal and Union Petroleum Minister Dharmendra Pradhan were present on the occasion. The Governor described that Modi is a living emblem for the society who is giving much more respect to mother India. Pradhan said that such type of inspirational movie will give mentorship to the youths. 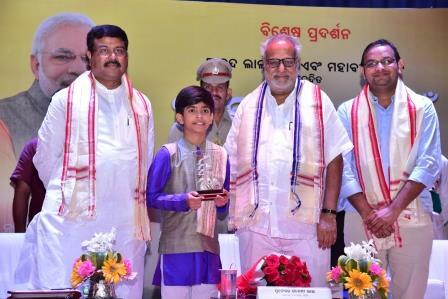 On the occasion, the child actor and co-actors of this movie were felicitated by the guests. The film, titled ‘Chalo Jeete Hain’, has been directed by Marathi filmmaker Magnesh Hadawale and produced by Mahaveer Jain and Bhushan Kumar which has been released on July 29, 2018. The 32-minute film is about a boy, called Narendra or Naru, in post-independence Vadnagar. It narrates the story of the boy who gets impressed by the words of Swami Vivekananda that “Wahi jeete hain jo doosron ke liye jeete hain (those live who wish to serve others).” The boy, the film suggested, was destined to serve the nation.